To link and apply these three research fields in a compatible way, an innovative and comprehensive Energy Models System (EMS) is developed, which combines and couples the single issue-specific models and tools from all REFLEX partners. 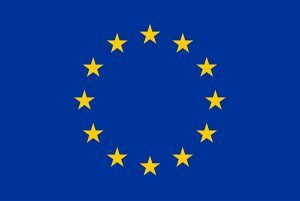 This model pool contains bottom-up simulation tools and fundamental system optimisation models for the different sectors on national and therewith also on European level as well as approaches for Life Cycle Assessment (LCA). To ensure a consistent system analysis, all models are based on a common database and scenario framework within the EMS. 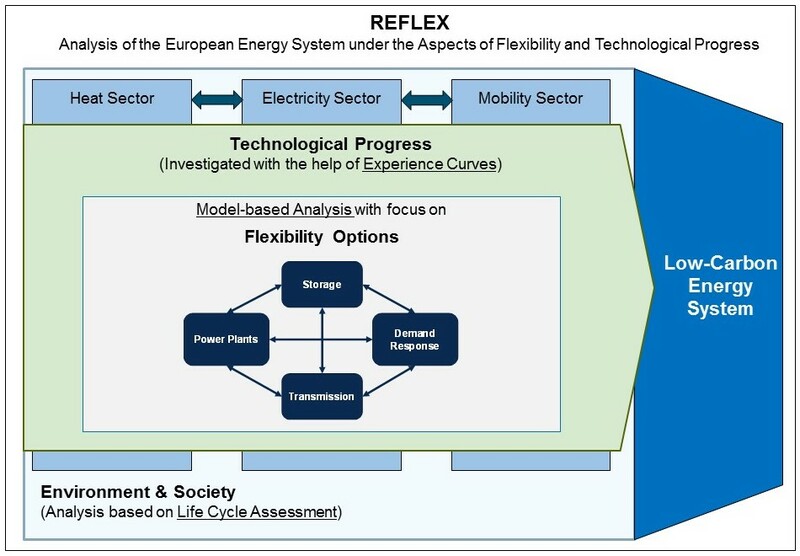 The model-based analysis in the REFLEX project includes the heat, electricity and mobility sectors, which are expected to experience substantial technological transformation within the next decades. In the mentioned sectors, all relevant energy carriers are considered. However, the up-stream industry in the fossil fuel sector is excluded from the bottom-up model-based analysis. Due to an increasing share of intermittent RES, the electricity sector faces the most challenging changes. Therefore, the assessments within REFLEX pay particular attention to it. The transition towards a low-carbon energy system requires improvements of existing as well as the development of new technologies. Technological progress can lead to fundamental changes, generating new challenges in the European energy system and triggering the necessity of other technologies. For example, the increasing share of intermittent RES requires different flexibility options. This includes technologies on the demand and supply side in the mentioned sectors, which can provide flexibility to the system or ensure security of supply. These are for example power-to-heat or power-to-gas, grid reinforcement and devices to exploit Demand Site Management (DSM) potential. Also the location of the intermittent feed-in from renewables, its self-marginalisation and its regional balancing is of importance and will be considered in the modelling. This means that, beside the supply and demand side, the transmission grid is considered in the integrated energy system analysis approach. To consider and assess the interactions and interdependencies between different sectors, technologies and policy measures like market design options, the model coupling is based on the exchange of relevant result data between the single issue-specific models. This allows to perform an in-depth and, at the same time, holistic assessment of the system transformation. The technology mix of a sector is mainly driven by technological development and cost reductions of energy technologies. For example, learning and scaling effects in wind and especially photovoltaic technologies over recent years led to a considerable decrease of specific investments. These effects were possible due to a large innovation and optimization potential along the entire value chain. With the help of experience curves, these aspects can be quantified and implemented into the models. In this way, learning and scaling effects of relevant technologies are taken into account when modelling the transition paths. Hence, experience curves are an important basis of the research and this project. They are deduced for a large range of technologies within this project. The high level of detail provided by sectoral models facilitates a comprehensive and precise assessment of the development of the energy system and the flexibility options in each sector considering the techno-economic evolution of the underlying technologies. The development of single technologies as well as of total sectors strongly affects the environment and the society. For example, lignite power plants lead to high(er) emissions but often low(er) electricity prices. In contrast, offshore wind power plants produce electricity at zero emissions but currently still at higher average costs. This example illustrates that the structure of the technology mix of each sector determines the impact on the society and the environment. When assessing different technologies and transition paths of the energy system, these impacts must be taken into account. Therefore, environmental and social impact analysis builds the framework of this project. For this purpose, different approaches will be applied and integrated in the EMS, such as integral indicators (e. g. determining external costs) or LCA (environmental and social life-cycle assessment – eLCA and sLCA). They facilitate the impact assessment of individual key future technologies as well as of entire energy scenarios, considering for instance energy and material use and related emissions. All results delivered by the sectoral and the LCA models will undergo a thorough evaluation process. This includes the discussion of assumptions and results with stakeholders from industry and public that joined the External Advisory Board (EAB) of the REFLEX project. The input from the EAB allows making realistic and robust assumptions that substantially influence the meaningfulness of the results generated. The critical assessment of the results through the EAB helps to put the outcome into a broader context and to obtain a first stakeholder assessment of the policy recommendations derived.